Maurice lives with his family in a two roomed rented house. His father is a casual laborer and his mother sells second-hand clothing. He has a younger sister. 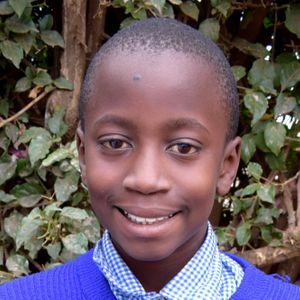 The Kinyago-Dandora Schools are located in the slums of Nairobi in Kenya, East Africa. Kenya’s population of more than 31 million has suffered greatly in the past few years due to epidemics of malaria, cholera, and AIDS and to a devastating East African drought that caused mass starvation across the country. Primary Education ~ Kinyago-Dandora School (KDS) has 592 students enrolled in primary classes (pre-school-8). Academically, KDS is one of the top schools in the district with a pass rate of 85%. Our students often win local music and sports competitions. Secondary Education ~ Students leave KDS primary school well-prepared for the transition to our Kinyago-Dandora Secondary School (KDSS) which is one of the few in all of Kenya with a formal music program and computer lab. KDSS has been ranked by the Kenyan Ministry of Education as one of the best schools in the Njiru District with a pass rate of 100% for graduating seniors. Post Secondary Education ~ The Bernard Sewe Scholarship Fund has been established to support KDSS graduates who attend colleges and universities across Kenya.